Just when you think you have seen just about all there is to see with Kickstarter watches, you have surprises like the Pheidippides Watches Porthole come along and rock your preconceived notions. These days, you really have to do a lot to differentiate yourself (and your brand), as cost simply is not enough. To that end, I think the Pheidippides Watches Porthole performs admirably. Why is that? Well, just take a look at the case shape of the Pheidippides Watches Porthole. Go ahead, the photo is right there, we’ll wait for you. Made of bronze, the 42mm case is all curves, with nary a sharp edge to be seen. Well, at least until you get to the sides of the lugs. Even the crown is rounded off, which seems pretty rare these days. 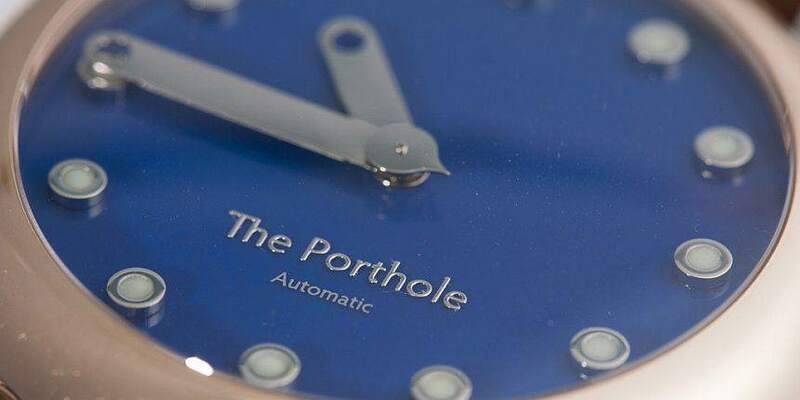 The whole concept of rounded edges (and the porthole theme) carries over to the blue lacquered dial of the Pheidippides Watches Porthole. For the hour indices, you have raised pips that call to mind the rivets of a porthole, except that these are filled with lume. Spinning over those you have polished steel hands with a corresponding cutout at the end of the hand to align with the pip (at least for the minute hand). One might wonder about the lumed indices and the polished handset though, right? UPDATE: The Kickstarter project was not successful, and is now currently active over on IndieGoGo.